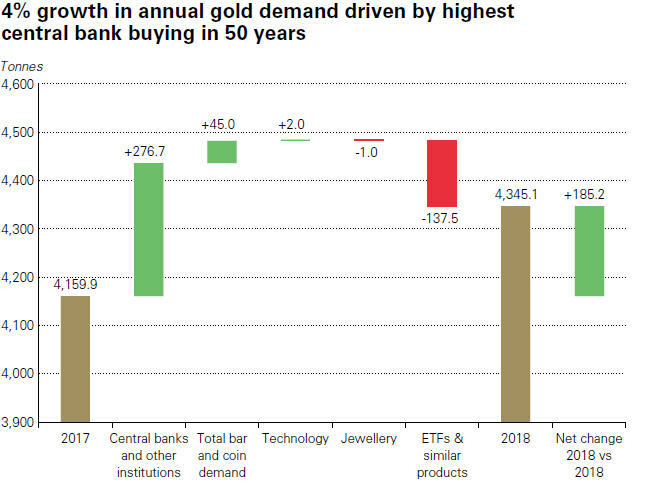 Annual gold demand increased 4% on highest central bank buying in 50 years. Gold demand in 2018 reached 4,345.1 tonnes, up from 4,159.9 tonnes in 2017. Central banks’ demand for gold soared to the highest level since the dissolution of Bretton Woods. Stock market weakness in the fourth quarter helped fuel inflows into gold-backed exchange traded funds, which resulted in 3.4B of inflows. The report reveals annual inflows into gold-backed ETFs slowed to 68.9 tonnes, 67% lower than the 206.4 tonnes in 2017. Sizable annual flows into European-listed funds (+96.8 tonnes) drove growth in the sector, the report reads. And while North American funds experienced heavy outflows for part of the year, strong global Q4 inflows propelled total assets under management to 2,440 tonnes by year-end, up 3% year -over-year from 2,371 tonnes. For the first time since 2012, the value of total gold-backed ETF holdings finished the year above $100B.